Maybe I am going to hurt a few feelings here, I am sorry, but I can’t help it. I discussed war movie characters I liked, some that I found obnoxious and now it’s the turn of those I think ridiculous. There are not that many (I certainly forgot quite a few). The question is probably also, what do I consider to be ridiculous. Let me explain my choices. 4. David Schwimmer as Herbert M. Sobel in Band of Brothers. This is really a ridiculous character. He is insufferable and makes himself look ridiculous by misjudging his own capabilities. 3. Blackburn in Black Hawk Down. I do have my problems with Orlando Bloom outside of Lord of the Rings. Occasionally I do believe he shouldn’t have done anything else than Lord of the Rings. When I spotted him in Black Hawk Down I couldn’t help sniggering. On top of looking silly the poor guy has one of the most ridiculous accidents in war movie history. He falls out of the chopper before the action even begins. 2. Nicolas Cage as Sgt. Joe Enders in Windtalkers. 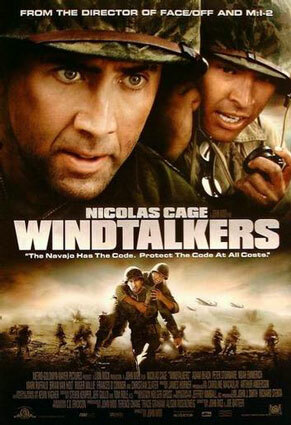 I have spoken at length about Windtalkers in an earlier post. A lot of my criticism is linked to Nicolas Cage being just so outrageously ridiculous in this movie. Bad, bad acting. If you suffer from post-traumatic stress, please, don’t look as if you were having indigestion. It is not becoming. 1. Mel Gibson in Braveheart. This simply beats it. Is anyone allowed to look this ridiculous? He was just the wrong man for this role. No amount of kilt-wearing, long hair or war paint can make this guy look like some pre 20th century warrior. This cast was a total no-go. I can not even remember the movie anymore, I was so entranced by his appearance. Mel Gibson on his worst hair day. 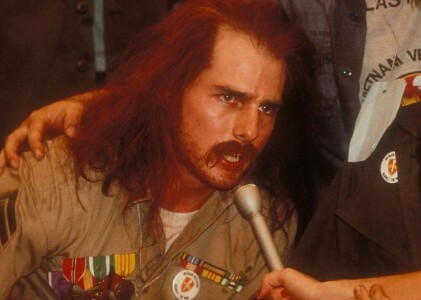 My absolute no 1. ridiculous war movie character. (Don’t get me wrong, I think he did a lot of very good movies, but this one was not for him). Actually, they should have let him ride a bike in it. This is one of my worst war movie experiences and probably even one of the worst movies in general. Already under normal circumstances (meaning when he does some decent acting of which he is capable) I’m not really a Nicolas Cage fan but in this movie his acting is frankly ridiculous. This is a parody of suffering and you don’t believe one second that his character is in pain. Definitely not from shell shock. Maybe one would believe it if someone informed you he had a bad case of piles. I had been told that this is not a good movie, although it has his followers, but I didn’t imagine it could be this flawed. There’s bad acting, a lot of explosions that seem to happen for no reason and a stupid plot twist when the Indian code talker plays a Japanese and enters the Japanese dugout with Nicolas Cage’s character in tow. Unconvincing? Embarrassing! Enough slagging off. What is it about and why did I not listen to the ones who told me? Purely because I’m interested in the history of the North American Indians. Apparently they had successfully been used as code talkers during WWII. A valuable asset to the American Army. Codes and code breakers are a vital element in any war (nicely shown in Enigma). Windtalkers tells the story of two Indian code talkers and their counterparts or body guards so to say during the battle of Saipan in the Pacific. But this is only what the Indians are told they are. On a deeper level those two men (one the insufferable Nicolas Cage and the other the convincing – as always- Christian Slater) are not only guardians but ultimately they could become executors. Since it would be fatal should the code get into the hands of the enemy, the men must see that those Indians are not taken prisoners under any circumstances and are killed in the event of imminent capture. This creates a lot of moral tensions. Would they really do it? The only good bit was the rites you see the Indians perform. What a pity. Had John Woo managed to tell us something like Glory does about the African-American soldiers’ participation in the Civil War… What a movie this would have been…well…he didn’t.